UVA undergraduate students can conduct cutting-edge research as undergraduate research assistants. Participating in undergraduate research provides hands-on experience and helps to prepare students for research-based careers in industry or graduate school. Many ChE undergraduate students conduct undergraduate research during their time at UVA. Students may begin working in a research group during their first year at UVA, and the information provided below is intended to provide a general overview of the process. Students are encouraged to speak with their academic advisor about how research can complement the UVA ChE experience. "My research is focused on studying and applying a novel material, metal organic frameworks (MOFs), to low-cost fabrics in hopes of creating a filtration device to remove air pollution and volatile organic compounds (VOCs) from the environment." Undergraduate research positions are filled by individual faculty members, and you will find that different faculty members have different approaches to the process. As a general guideline, though, you will need to contact faculty (either via e-mail or in person at AIChE events, after class, etc.) to express interest. It is best to contact faculty as early as possible to maximize the opportunities that may be available to you. Don't be afraid to be persistent! You may not receive a response to your first attempt to contact a faculty member. Most faculty receive a significant amount of e-mail every day, and sometimes e-mails fall through the cracks. It is also for this reason that seizing opportunities to talk to a professor in person can be particularly helpful. Be prepared for a response asking you to follow up at a later date, particularly if the group is currently full. It may take some time to secure a position in a lab if many students are interested. Why are YOU the student for the job? To help make a convincing argument that you are the right student for the position, it is useful to think of the overall situation. You, as the student, are seeking an educational experience to learn about the research process and make a contribution to a larger research effort. The research group (faculty, graduate students, and/or postdocs) will expect deliverables from you in exchange for time and money invested to give you the opportunity that you are seeking. Therefore, you should be ready to commit time and effort to the position (and follow through on those commitments). Academic research is serious business; graduate students are working toward advanced degrees, faculty seek to publish papers and work hard to secure grant funding to continue research efforts. As such, faculty look for serious undergraduate researchers who are commited to participating in that environment. As with applying to any other job, think about how your experiences, skills, etc. make you the right student for the position. Pursue a variety of undergraduate research opportunities. As the undergraduate research process is not as uniform as, for example, applying for college, it may be useful to pursue multiple undergraduate research avenues. At UVA, some programs are in place to help students identify and secure undergraduate research positions (e.g., opportunities through the UVA Center for Undergraduate Excellence). Additionally, you may want to pursue a summer research opportunity at a different university. Often called REUs (Research Experience for Undergradautes), these programs are typically paid positions that run for several weeks during the summer. Applications are generally due in late winter / early spring, and many programs also provide housing options/assistance. Some of these options may be helpful if you are trying to get a position in a competitive research group. For example, performing well in a REU position over the summer might help increase the chance of getting into a competitive research group at UVA during the academic year. Once you secure a position as an undergraduate researcher, your faculty advisor will discuss specifics related to safety training, lab-specific training etc. You may work directly with your research advisor, or you may work more closely with a graduate student or post-doc depending on the lab and/or the project. The majority of undergraduate research positions are volunteer positions. In some cases, the positions can be paid positions if the project is sponsored. Students also have the option of taking research for credit (i.e., CHE 4995, which can count toward your degree as a technical elective). If research is taken for credit, the faculty advisor will provide details about expectations, deliverables, and the grading structure for the course (i.e., course syllabus information). It is not permissible to simultaneously take research for course credit and be paid for that research. Showcase your hard work for others to see! You will likely want to share the fruits of your hard work in the lab with others, and there are opportunities to do so both at UVA and externally. For example, the Undergraduate Research Network (URN) at UVA often runs an annual research symposium where undergraduate researchers present their work. 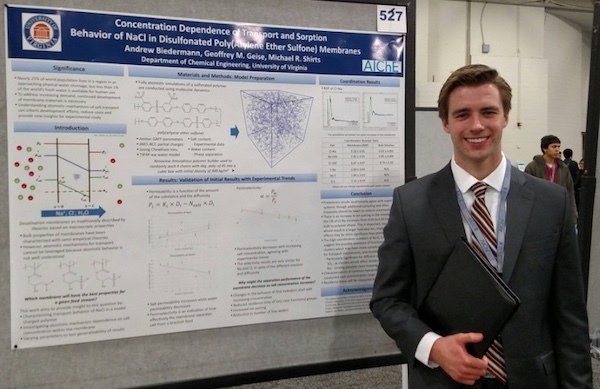 Additionally, the AIChE Student Chapter at UVA often coordinates travel to the annual AIChE student conference where undergraduate researchers can present their results to the broader chemical engineering community.